Explore Paul’s idea of the “armour of light,” as found in his letter to the Christians in Roman. •	MUSIC – teach and sing "Last night I had the strangest dream," or "Let there be peace on earth"
Romans 13. 11 – 14. The night is far spent, the day is at hand: let us therefore cast off the works of darkness, and let us put on the armour of light. Let us walk honestly, as in the day; … Put ye on the Lord Jesus Christ…(King James Version). AFTER STORYTIME IN CHURCH, ALL CHILDREN MEET IN THE CHURCH HALL FOR GATHERING TIME, BRIEF REVIEW, THEN GO TO SCHEDULED WORKSHOPS. 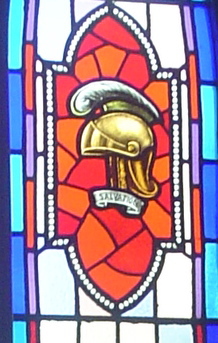 This variation on the armour of light is found in a letter to the Christian community in Rome, and is attributed to the apostle Paul, a disciple of Jesus. WHERE IS OUR KEY VERSE FOUND IN THE BIBLE? It’s found in Paul’s letter to the Romans, the book of the New Testament called Romans. The following points are helpful, and found in the NOAB/NRSV (New York: Oxford University Press, 2001). -	“Letters are the earliest documents in the New Testament, and its most common literary form” (p. 240). -	“Some scholars date 1 Thessalonians before 50 CE, twenty years before Mark’s gospel” (p. 240). -	“Thirteen of these letters are from Paul or his missionary associates” (p. 240). -	“The Greek work “epistole,” “letter,” originally referred to an oral communication sent by a messenger…. Even in the New Testament period, the letter-carrier might be entrusted with crucial information about a letter’s content” (NOAB, p. 240). -	Although, because of its length, it is the first in the letters of the New Testament, Romans is probably the latest of Paul’s undisputed letters to be written”(NOAB, p. 242). -	The letter was occasioned in part by circumstances in Rome during the reign of the Emperor Nero (54-68 CE). The greetings…may reflect Nero’s reversal of his predecessor’s edict [Claudius’s, to expel Jews from Rome]. The recent return of Jews to the imperial capital, including Jewish Christians like Prisca and Aquila, who had been driven out and probably lost property and community ties during their exile, may well have aroused tensions within the Christian house groups in which Gentile believers had become predominant” (p. 242). -	Universal accountability before God, Paul’s theme throughout the early chapters of the letter, is more specifically applied in chapters 12 – 16. Rather than being a treatise on Christian salvation, Romans is a sustained appeal for holy living, directed to Gentile Christians tempted to look down on their beleaguered Jewish neighbors, within the Christian congregations and without. The apostle’s call to realize in common life the justice of God which the Christian congregation celebrates is the letter’s enduring legacy” (p. 243). NOW, WHAT DO WE MAKE OF ALL THIS BUSINESS ABOUT ARMOUR? When we hear phrase like “armour of God,” or “armour of light,” we all easily picture the sword and helmet of the Roman imperial soldier. Millenia of images, like the beautiful helmet of salvation from Norval Presbyterian Church, near Toronto, Ontario (seen at top of this lesson), have helped to burn these images into our collective memory. But is this likely what Paul meant? “Paul opposed Rome with Christ against Caesar, not because the empire was particularly unjust or oppressive, but because he questioned the normalcy of civilization itself, since civilization has always been imperial, that is, unjust and oppressive…. It’s important, then, to reinforce the idea that Paul would have wanted to emphasize non-violence and justice, rather than war and victory, in his letter to the Christians in Rome. It’s the degree of reassurance and protection, rather than the tool (like helmet) for providing it that would have been easily identifiable by his readership, that’s of greatest significance in this passage. Therefore in this study unit, the object of the exercise will be to get the children to imagine a “new look” for Paul’s armour of light. Typically, armour of light looks a lot like gear from the Roman army. 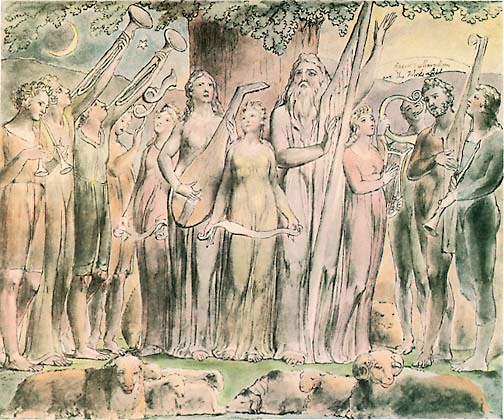 Perhaps we should imagine something more like the garments William Blake clothes his figures in in the restoration of Job’s family in his work from 1825. Click here to see this artwork. Music that captures the sentiment Paul expresses here would be primarily appeals for peace. There’s a piece I really like by ‘local’ artist, Glen Soderholm, of nearby Campbellville, Ont. It’s called “Peace of Christ,” from his album Rest. He does the opening as a kind of a cappella chant. My ear can hear a children’s chorus doing it. Click here for Glen's website. That musical reference may be a bit obscure. And what about the old classic, “Let there be peace on earth.” Another nice one for children’s voices. An attribute to awe and majesty. Wherein doth sit the dread and fear of kings. It is an attribute to God himself. “The night is far spent, the day is at hand; let us therefore cast off the works of darkness, and let us put on the armour of light. The rhythm is wonderful – delicate and consistent, not a one-two marching beat, but more of a one-two-Three, almost waltz for the most part. The word choices of the King James translators create an overall picture that’s closest to the spirit of Paul, I think. The comfort in the familiar and childish excitement in the simple acts of waking up from a long night’s sleep, pulling on a fresh set of clothes, and putting one foot in front of the other to greet, with Christ, whatever adventure the new day brings. 1. Describe how it feels when you wake up in the morning and remember you have a certain thing or project you wanted to do? 2. What do you think the armour of light would look like? 3. Would it be light or heavy? 5. What do you think it means to walk honestly? 7. By this, do you think Paul wanted people to get out and fight for peace? Or something else? How would you describe the something else? Live your life in a way that helps people to get along. Like being forgiving? 8. Can you name a situation in which you were forgiving, and this action helped you stay friends with someone? 9. Can you think of a situation in which you were relieved that someone forgave you, so that you could still be friends? 10. Do you think going through a time where people aren’t friends, aren’t forgiving, could be described as a “dark” time, like night? 11. Do you think an experience of forgiveness makes it feel like daytime, like sunshine bursting in on a dark time? 12.	Who helps you get through the dark times to the daylight? 1. Quickly review or recap the story with them before starting activity. Each week, see how much more detail each group of kids can supply on the story they've been studying. 2. Link or explain your activity to the current story. WHY: To get children to think about how the comforts of God’s kingdom are different that the protection of worldly empires. MATERIALS: large pieces of cloth (could be old bed sheets), scrap material, felt pieces, glue, embellishments such as beads, sequins, etc. IINSTRUCTIONS: Have the children make ‘garments of God’s kingdom’ out of cloth. Get them to brainstorm what images they might cut out of the felt or scraps to glue on to the garments to symbolize peace. I’m thinking hippie flower power, lots of daisies…! ARTS 2 – Create ‘armour of light’ from clay. Material – Lots of plasticine, or even homemade salt clay in different colours. Directions – Have the children sculpt a person (themselves?) out of clay. Then dress the figure in their interpretation of the armour of light. Suggest they think of their vestments as the ‘garments of God’s kingdom’ if they get stuck on armour. Directions – There’s lots of stained glass that shows Roman armour. Let’s present some alternatives! Get permission from your church to paint (wash-off-able) designs on a clear glass window. Depending on the window, figure out how to segment to children can work on separate portions, perhaps in teams. Have them sketch out image on paper first. Then apply their concept to the window using tempera paint mixed with dish soap. Activity – make Goodness & Light Parfaits. Why: To reinforce the ‘light’ in the armour of light. Ingredients – vanilla oreo or Girl Guide cookies, Cool Whip, cups of vanilla pudding, tallish dessert dishes.. Instructions: Have the kids crush several cookies. Put half of crumbs in bottom of parfait dish. Add a big spoonful of pudding, then a big spoonful of cool whip. Repeat each layer. Top with more crumbs. Ahh, the rewards of being a child of the light! Material – clubs, bent hangers or floral wire, ball. You could use a dollar store mini golf or croquet set for this. If you’re worried about kids clobbering each other, try this. Activity – Goodness and Light theatre. Act of same scenarios using militant and then peaceful approaches to resolution. Why – will remind the children that those who put on the Lord Jesus Christ seek peace through kindness and mercy. -	you find out your friend shoplifted when you were out at the mall. -	What would you do? One team will show the selfish approach. So for the situation of the purloined twoonies, they show some yelling and a fake smack. The other team will show the forgiveness approach. It will show that putting on the armour of light means trying not to get angry and explaining to the little brother why he just can’t take whatever he wants, and maybe learning that older children should put their special things away. -	Use KidPix3 to create an illustrated poem. Have the children type in the key verses. Then they pick a backdrop to drop the poem on to. Then embellish with stamps, etc. Print out. Mount on construction paper. Take home for mounting or scrapbook. Components of these lesson sets may be used for non-profit educational purposes, citing this author and site.